BEN MODEL has recorded his original scores for dozens of DVD and Blu-ray releases on both piano and theatre organ, and several of these have aired on TCM. Ben has scored silent films for major distributors like Kino Lorber and Milestone Films, as well as independent labels like ReelclassicDVD and Thanhouser. In 2013 he started his own label, Undercrank Productions, and has released 17 DVDs of rare silent films unseen by the general public since their original release. Notable among the many releases scored for Kino Lorber on both DVD and Blu-ray are Sherlock Holmes starring John Barrymore, Edison: The Invention of the Movies, Buster Keaton in The Saphead and The Ultimate Shorts Collection, Harry Houdini in Haldane of the Secret Service, Rudolph Valentino in The Sheik, W.C. Fields in It’s the Old Army Game (for rel. March 2018) and Fritz Lang’s The Spiders. 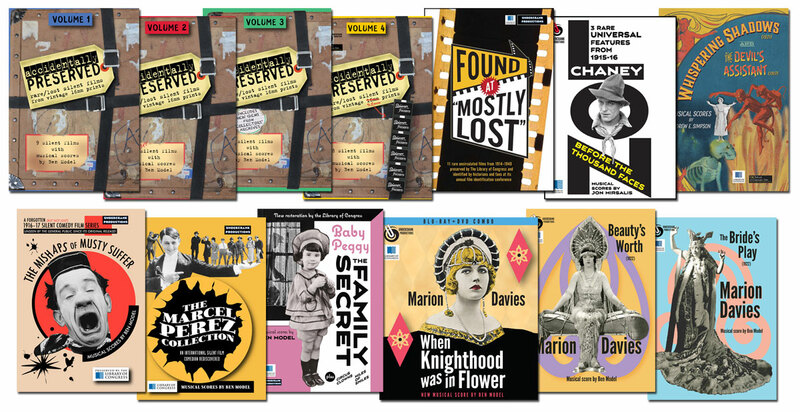 Undercrank Productions is Ben Model’s DVD label, showcasing rare silent films in new releases starring stars such as Marion Davies, Baby Peggy, Marcel Perez, Musty Suffer, and more. Undercrank Productions has a co-branding arrangement with the Library of Congress and with the Hugh M. Hefner Moving Image Archive. A majority of Undercrank releases are from 35mm archival prints from the Library of Congress. Indie label ReelclassicDVD’s silent releases list included many discs scored by Ben Model, including Our Gang silent films, Norma Talmadge in The Forbidden City, and a deluxe edition of Phantom of the Opera. Quality transfers in standard-def from excellent 16mm prints, many of which are from the Bob Lee (Essex Film Club) archive.